San Luis Obispo, CA…SAN LUIS OBISPO, Calif., Dec. 8, 2016 /PRNewswire/ — The 10 destinations along California’s Highway 1 Discovery Route (H1DR) in San Luis Obispo County from Ragged Point and Cambria to Avila Beach and Oceano are serious when it comes to the annual Coastal Discovery & Stewardship Celebration. Coastal San Luis Obispo County along with California State Parks and the Monterey Bay National Marine Sanctuary welcome visitors to immerse themselves in the local marine culture, coastal heritage and natural attractions along the iconic CA Highway 1 Discovery Route through a series of events and activities January 13-February 28, 2017. Enjoy special marine focused events, unique wine and food tastings and festivals and stewardship travel activities where you learn more about dedicated Marine Protected Areas and how to make a difference on vacation. Find new and renewed happenings at the Fourth Annual Coastal Discovery & Stewardship Celebration along the CA Highway 1 Discovery Route. These special events and activities are designed to connect visitors with the land, wildlife, history, people and culture along the H1DR. Must-see attractions and must-do events include a Free Film Festival at Hearst Castle Theater, the 3rd annual wine tasting event BlendFest on the Coast, the fun Bird Sanctuary & Wildlife Day, elephant seal docent-led educational walks, hands-on citizen science programs at San Simeon Cove and many others. Take a whale watching adventure, a planned pier and beach walk, or learn about H1DR marine birdlife with the free SeaPhoto App from the Monterey Bay National Marine Sanctuary. Visitors will appreciate the Wildlife Viewing and Stewardship Tips when they visit the new Whale Trail (www.TheWhaleTrail.org) locations and will delight in special wine tasting room pairings from 11 wineries located along the Pacific Coast Wine Trail, and numerous Edna Valley, Arroyo Grande Valley and Avila Beach wineries as well. Located halfway between Los Angeles and San Francisco, the H1DR is made up of ten diverse artisan towns and seaside villages starting just south of Big Sur from Ragged Point & San Simeon, Cambria, Cayucos, and Los Osos/Baywood Park, to Avila Beach & Valley, Edna Valley, Arroyo Grande Valley, Oceano and Nipomo, just south of San Luis Obispo. 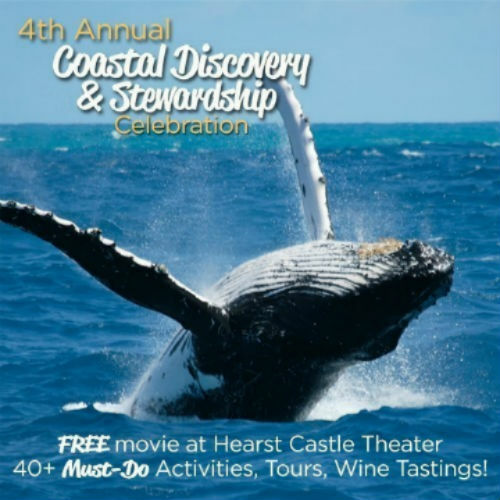 Many lodging properties along the H1DR are offering specials and packages during the Coastal Discovery & Stewardship seven week celebration.